A recent survey of 550 members of the Cloud Native Computing Foundation confirmed that Kubernetes is the orchestration platform of choice. The survey also reaffirmed that Amazon Web Services continues to be the leading choice for deploying Kubernetes clusters in the cloud. kubernetes-aws.io lists various ways you can easily create a Kubernetes cluster on AWS. As part of your development cycle, you may also want to run Kubernetes on your local machine, so that you can start and debug your applications locally. Once you are satisfied with the local version, you can deploy the exact same application on a cluster running on AWS. 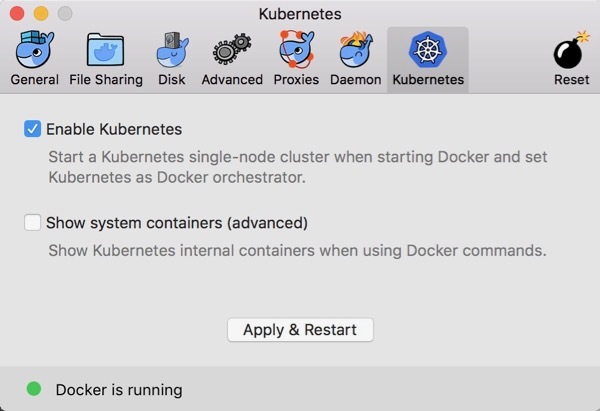 This post presents two options for running Kubernetes locally on a Mac OS X machine: commonly used Minikube and the newly-introduced Kubernetes support in Docker for Mac. Instructions for other platforms are available on the Minikube and Docker websites. By default, the kubectl version command prints the client and the server version. --client ensures that only the client version is printed, as no cluster is running at this time. --short option allows you to print only the version number. Now that kubectl is installed, let’s look at the two options to get a Kubernetes cluster running on the local machine. Minikube runs a single-node Kubernetes cluster inside a Virtual Machine (VM) on your laptop, providing a local development and testing environment for users interested in playing with Kubernetes. As you can see here, we have created only one Kubernetes cluster so far. If multiple clusters had been created, they would all be listed by this command. All the usual kubectl commands can now be applied to this cluster. Docker for Mac/Docker for Windows provides a starting point for developers interested in getting started with Docker. Docker for Mac can be downloaded as a Stable or Edge release. The Stable version is fully baked and tested, and comes with the latest GA release of Docker. The Edge release, as the name indicates, offers the latest bleeding-edge features. One such feature introduced as part of the private beta for Docker CE Edge release, version 17.12.0-ce-rc2-mac41 to be specific, supports a single-node Kubernetes cluster for development and testing. Let’s take a look at how you can use Docker for Mac to set up a local Kubernetes cluster. To get Kubernetes access from Docker for Mac, you’ll need to sign up for the Docker Beta program. After your Docker ID is approved for Kubernetes access, you will be sent a link to download and install the Edge version of Docker for Mac. Make sure that About Docker shows the version as 12.12.0-ce-rc2-mac31 or later. A new tab that allows you to configure a Kubernetes cluster is now shown in the Preferences dialog box. Select Enable Kubernetes, then click on Apply & Restart to start a single-node Kubernetes cluster. In a few moments, the status bar will be updated to reflect that Kubernetes is running, in addition to Docker. Notice, kubernetes is shown as the orchestrator, as opposed to the default swarm. You now have the latest Kubernetes scheduler with the latest Docker runtime, with a single tool! Once again, all the usual kubectl commands will work on this cluster. Once you’ve done the initial development and testing of your application on a local Kubernetes cluster, our Kubernetes workshop will guide you through how to create a Kubernetes cluster on AWS and deploy your applications on that cluster.